HTC VIVE announced a new hardware bundle featuring Fallout 4 VR, one of the most anticipated VR titles to date. Starting today, October 2nd, customers who purchase an HTC Vive, will receive a free redemption code for Fallout 4 VR, a $59.99 value, which launches on December 12, 2017 (vive.com/fallout4-vr). Fallout 4, the legendary post-apocalyptic adventure from Bethesda Game Studios and winner of more than 200 'Best Of' awards, including the DICE and BAFTA Game of the Year, and most recently 'Best Virtual Reality Game' at gamescom 2017, finally comes in its entirety to VR. Fallout 4 VR includes the complete core game with all-new combat, crafting, and building systems fully reimagined for virtual reality. 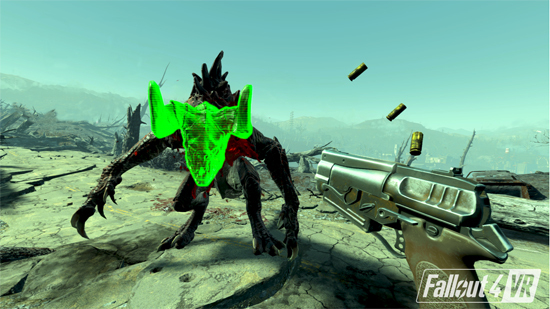 "Fallout 4 VR is the most anticipated title for VR this holiday, and the game development team at Bethesda Game Studios is delivering on the promise with a full-length AAA open-world game that takes advantage of Vive's incredible room-scale immersion for a mind-blowing experience in the Wasteland," said Joel Breton, GM of Vive Studios. "The promise of a game with near endless content, including hundreds of locations, characters, and quests, fully playable in VR, is something that we have been focused on providing for the VR gaming community. We are now thrilled to provide this incredible game to new Vive owners and eagerly look forward to game's launch on Vive this December." The freedom of exploring the wasteland comes alive like never before when experienced using Vive's superior room-scale technology. Vive's submillimeter tracking for responsiveness and accuracy makes it the most immersive way to experience Fallout 4.